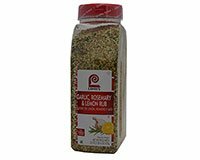 Lawry's Garlic, Rosemary, Lemon Seasoned Rub adds the zesty flavors of lemon, rosemary, black pepper, and garlic to fish, poultry and vegetables. Shake or rub Lawry's Garlic, Rosemary, Lemon Seasoned Rub onto fish steaks, boneless, skinless chicken breasts or turkey steaks before grilling, baking or broiling. Season chunks of fish with Lawry's Garlic, Rosemary, Lemon Rub and then skewer for charboiling. Skewer shrimp for grilling, brush with olive oil and then season with Lawry's Garlic, Rosemary, Lemon Seasoned Rub. Toss scallops with Garlic, Rosemary, Lemon Rub and olive oil and then skewer for easy handling on the grill. Shake or rub Lawry's Garlic, Rosemary, Lemon Seasoned Rub over entire surface and inside cavity of whole chicken or turkey using about 1 tsp per pound. Shake Lawry's Rub over chicken pieces. Toss chicken wings and drummettes with Lawry's Garlic, Rosemary, Lemon Seasoned Rub before cooking. Season flour with Lawry's Garlic, Rosemary, Lemon Rub and then dredge fish before frying. Sprinkle Lawry's Rub over fish and shrimp after frying. Season your flour or breading mixture with Lawry's Garlic, Rosemary, Lemon Rub for fried chicken. Ingredients: Salt, Spices (Including Rosemary), Modified Corn Starch, Garlic, Citric Acid, Sugar, Lemon Peel, Onion, Red Bell Pepper, Natural Flavor and Riboflavin (For Color).